Today and Tonight: Morning fog to start your Wednesday, but it will lift by 9 AM while temperatures warm into the mid-70s. Temperatures will continue to warm into the 80s by 10 AM, with an afternoon high of 90°. Clouds will continue to break through the morning, as winds will increase slightly out of the northeast, but staying around 5 mph. Clear skies will stay the course this evening, with temperatures dropping into the 70s around 10 PM. Winds will stay light out of the east overnight, and we approach a low temperature of 71°. 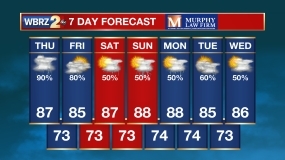 Up Next: Dry conditions stay through the rest of the workweek, as temperatures warm into the low to mid 90s, and staying above average into the weekend. Things will stay sunny through Friday, but spotty showers return Saturday and Sunday. The frontal system that brought us showers and storms on Tuesday, is now offshore and will break up through as it travels south into the Gulf. High pressure is to our north, and will break south through the rest of the workweek. This will provide sinking air and sunny skies through Friday. This high pressure will travel east over Florida over the weekend, allowing winds to come in from the south and increasing the potential for afternoon spotty showers. Moisture will be sticking around through the weekend and into the workweek, increasing as we get closer to the midweek.